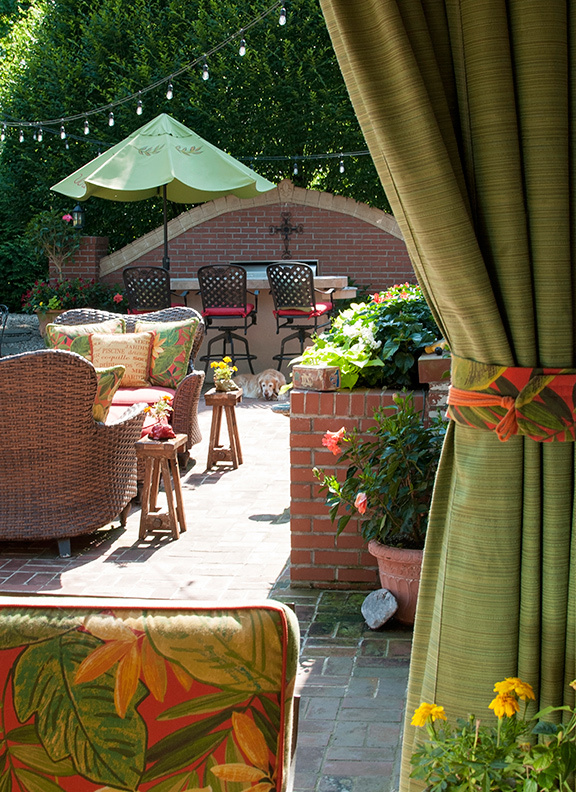 With the guidance of longtime friend and designer Mary Tramelli, a West County homeonwer has created her own little corner of Italy inside and out. Color. 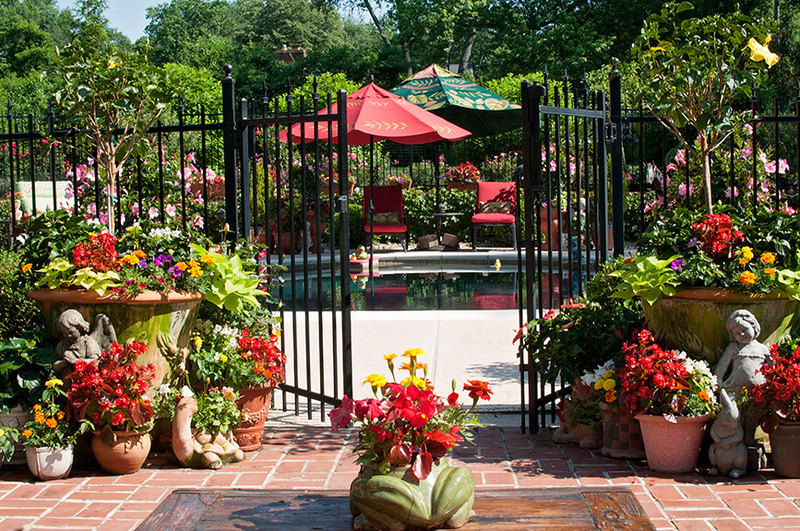 Bold, beautiful, exuberant, raucous, dazzling color sets the tone for this spectacular West County pool and patio space. But just below the brilliant surface, there is sentiment, nostalgia and peace. To understand both aspects, requires knowing the story of how the garden came about. It began when the homeowner’s mother passed away leaving her the family ranch-style home and 2.5 acres of property. Comfortably situated in a charming house of her own at the time, her first instinct was that the dated home, and in particular the huge yard, was not something she wanted to take on. But then other thoughts crept in. “It was a simple little ranch house that my parents bought in 1946. At that time it was a farm. They wanted a life in the country,” she explains. “I grew up in that house. I was very connected to it.” She quickly realized selling the property was not an option. Transforming it was. Having been born in Italy and with strong ties to her Italian heritage, she set about making her family home “my little corner of Italy inside and out.” To help with the project, she called upon her high-school friend and college roommate, designer Mary Tramelli, who specializes in decorating both the inside and outside of homes. Mary knew her client well. “Her big thing is that she is crazy in love with everything Italian; bright, happy Italian,” Mary confirms. The project, which took over a year, began with the construction of a swimming pool, which the homeowner and her two golden retrievers Nino and Gabriella could enjoy during the home-renovation phase, even though they weren’t living at the house. For the re-construction the homeowner called in family friend Chris Pagano of Pagano Land Development LLC. His son S.J. Pagano acted as project manager. Chris was immediately on board with the homeowner’s concept. “We built the patio, porch and walls to look as though they had been there forever,” Chris explains. Nostalgia is everywhere. The homeowner’s vivid memories of her parents hand-laying the bricks for the home’s front-porch floor meant that Pagano picked up all those bricks, put them on a pallet and used them in the construction of the new patio. 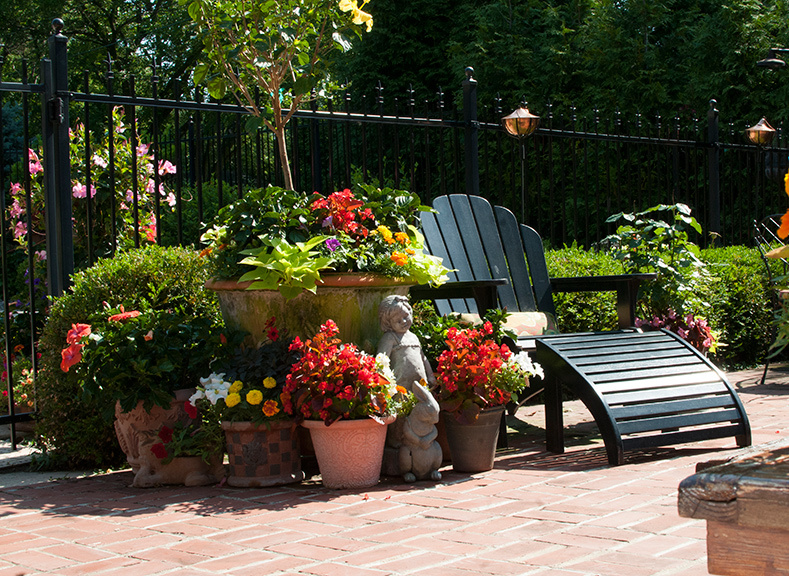 Patio and porch furniture also have ties to the past. “My parents brought that furniture back from Italy in the 1950s. I still have the bill for $250 including shipping. That furniture wasn’t going anywhere; it was staying,” she says firmly. Once a covered porch, the tile-floored room on the back of the house became the homeowner’s vibrantly colored Positano room, named for the spectacular Amalfi-coast town. French doors from that room and the dining room flow into the outdoor spaces. "In her house she is into bright, bright color,” Mary explains. “It snowballed right outside onto her porch and patio; pink, purple, orange, red and green. Everything is bright and happy. Views from the house onto the patio, porch and pool are important. But also, Mary and the homeowner discovered, were views from the pool back to the house. 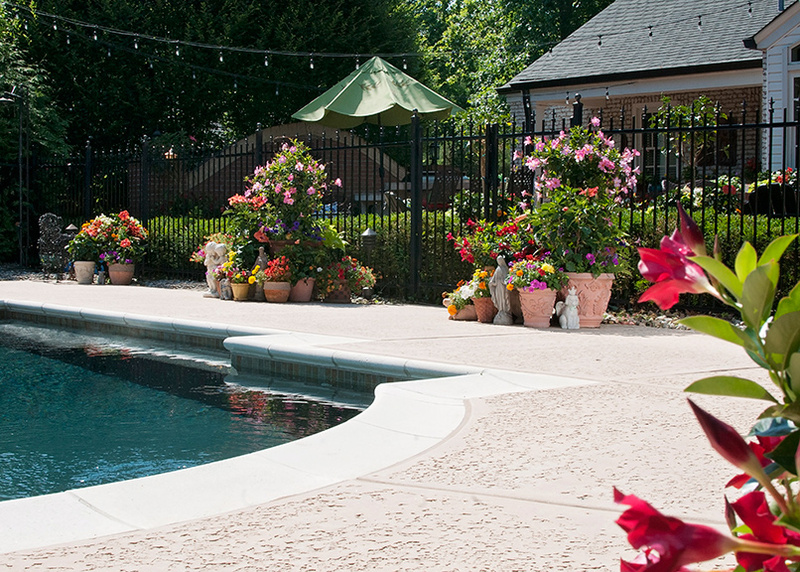 The patio was under construction and both women were enjoying a swim, when Mary looked back at the house and realized the left needed an additional structure to balance the wall on the right, so an arched wall was added. 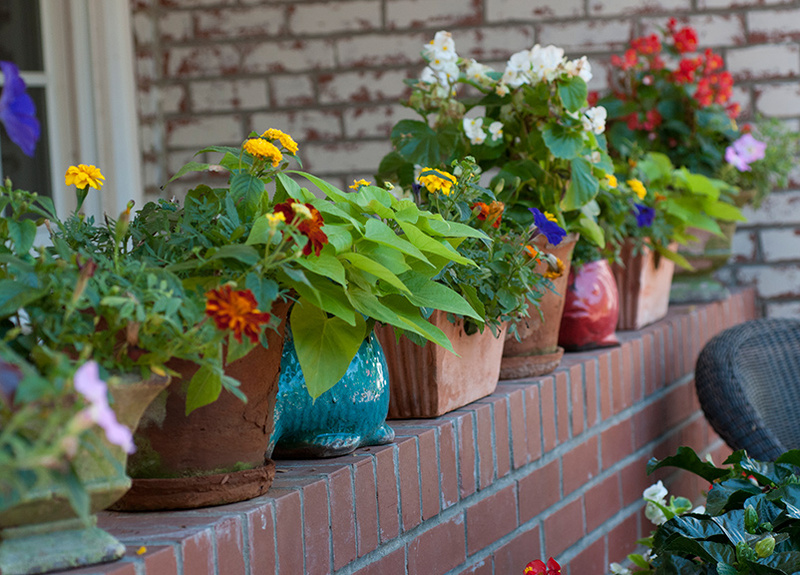 Rather than permanent plantings, containers dominate the patio, porch and pool area. 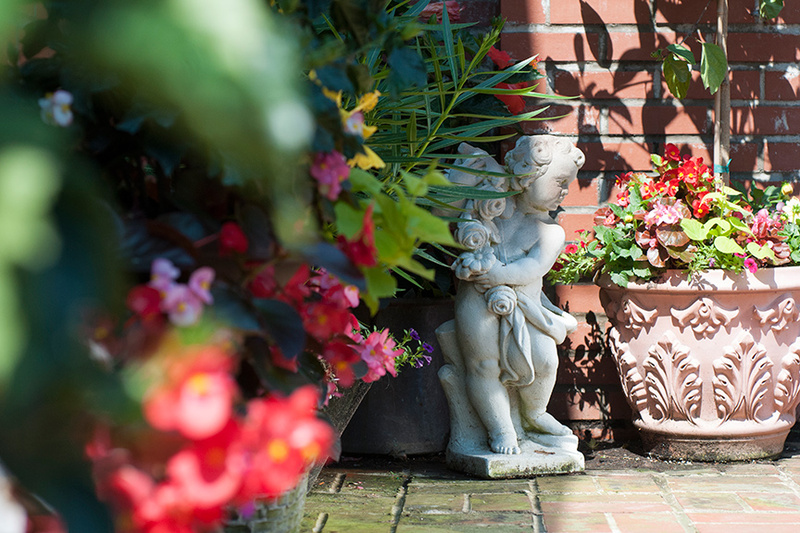 Hibiscus and “Dragon Wing” begonias are two of the homeowner’s favorite patio plants, but just about anything goes, so long as it is colorful. Pink and red mandevilla vines add height to containers. Chartreuse sweet potato vines trail to the ground. 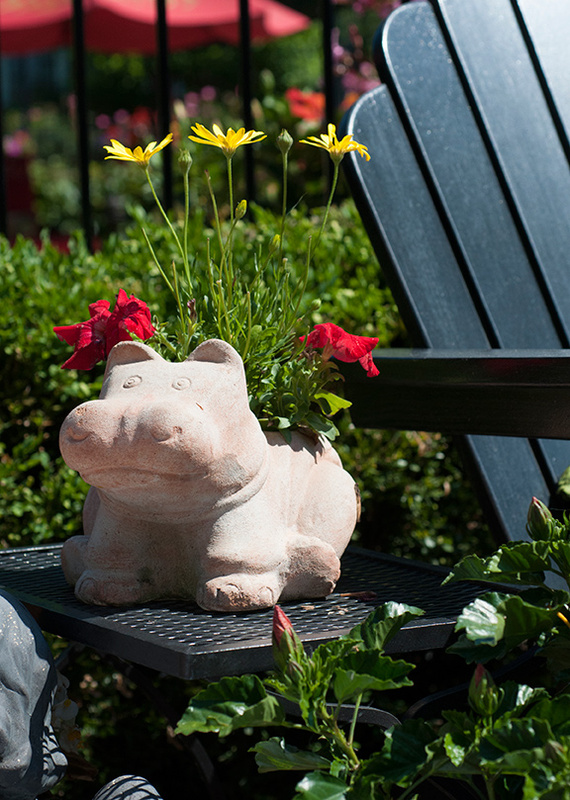 Marigolds, petunias, bedding begonias and lantana all find their way into the homeowner’s containers. Many of those containers belonged to her parents, others came from her previous home and garden, and still others have been purchased with the current garden in mind. Statuary also is prevalent with many of the pieces having been part of her grandparent’s and parent’s homes and gardens. She collected other pieces on trips to Italy; some were gifts from friends. Francesca is the most dominant gift. Friends purchased the almost-life-sized, rusted-metal horse sculpture in Santa Fe and displayed it in their St. Louis garden. When the friends moved to Santa Fe permanently, Francesca did not make the return trip. Instead she is now stabled poolside, festooned with twinkling white lights at night. The glow from Francesca, plus strings of Tuscan café lights gleaming overhead, turn the pool and patio into a true Little Italy after dark. “It is so beautiful people come over at 9 p.m. and swim under the lights,” the homeowner says. 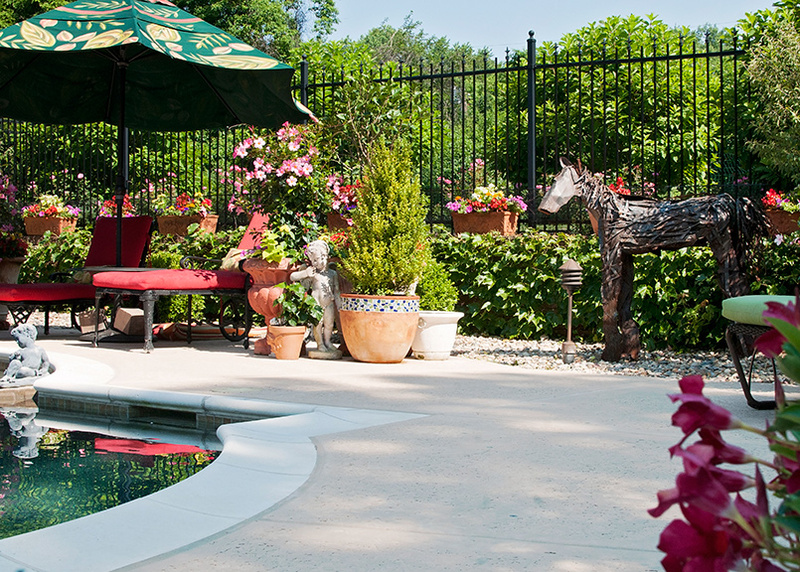 Providing a gathering place for family and friends has been a special benefit of the house and garden renovation. While once the homeowner thought the 2.5-acre property was more than she could handle, she now has thoroughly embraced the landscape with the help of Bill Minford, landscape designer with Sherwood’s Forest nursery. It should come as no surprise that Bill’s instructions are to continually add colorful shrubs and perennials plus evergreen screens of “Green Giant” arborvitae, “Bracken’s Brown Beauty” magnolia and Norway spruce.